Found this under the free category on the Amazon Kindle store. What prompted me to read this book was all the negative reviews, which, after reading myself, found they were vastly unwarranted. This is a great first effort by Elizabeth Sherry in the Romance-Mystery genre. Sure there are grammatical errors, but there aren’t any continuity errors, the book flows smoothly, character and place are well-written. More than likely, Elizabeth doesn’t have a team of editors, proofreaders, historians, publishing house behind her like the ‘big writers’ do. Many indies out there are in the same boat, writing to the best of their ability, creativity is their strong point while editing/proofreading is not. And that’s ok with Under the Aspens. The main characters have been vetted, fully fleshed out. They are wholly three dimensional, as are all the characters. Is the romance part a bit saccharine? Coming from the Mystery genre, yes, but I admit Romance isn’t my favorite. I found the mysterious ex-husband and his cohorts to be intriguing, the illegal activities well-thought out. The plot was well-thought out enough to capture my attention to finish the book to find out what happens next. All loose ends are neatly tied-up, the reader isn’t left hanging, wondering what went on, etc., baiting you to buy the next book as some authors do-even the ‘big writers’. 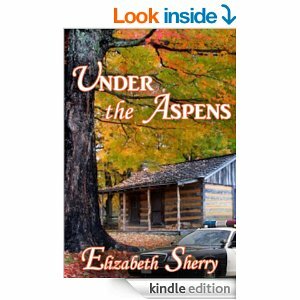 Overall, I would recommend Under the Aspens by Elizabeth Sherry for an easy evening read when there isn’t anything on TV. I would give 3 1/2 stars.